Editor's Note: The following is a fictional story and is not meant to portray any actual people nor to give medical advice. Dolores is a 34-year old married mother in Miami with 3 children. Recently, she lost her job and is stressed about her family being able to pay bills. She needs a new job, but knows she lacks the skills that will make her competitive in the job market. She’s not sleeping well and begins having arguments with her husband, which only makes her feel worse. Doctor West: Dolores goes to Dr. West, a general practice physician and tells her what she’s been experiencing. Dr. West diagnoses Dolores with general anxiety disorder, but isn’t fully sure if it constitutes clinical depression, so she prescribes her a common anti-anxiety medicine, which Dolores has never taken before and is not sure if she will experience side-effects. Before going to the pharmacy, Dolores receives some general health advice from Dr. West, as well as the business card of a clinical psychiatrist, in case her symptoms worsen, and a large bill for the 25-minute meeting. Unless Dolores experiences negative side effects from the medication or if her symptoms worsen and she will not see Dr. West again. Conversely, Dr. West will not know if Dolores will be successful in managing her anxiety or if she ever found a job. Doctor East: Dolores goes to see Dr. East, a licensed acupuncture physician, and tells her what she’s been experiencing. Dr. East knows that Dolores' job loss is a root cause of her issues. Dr. East knows that in order for Dolores to find a new job, she first needs to gain her mental health back. She books Dolores for regular acupuncture treatments to treat insomnia and stress. She also gives Dolores a dietary plan to improve her focus and increase energy levels. Dolores eventually opens up to Dr. East and tells her that she’s enrolling in a certification program to make her more competitive in the job market. Dr. East is supportive of Dolores' career goal and prescribes her Chinese herbs that help with memory and concentration. Since Dr. East has been able to monitor Dolores’ health regularly, she knows to switch her over from acupuncture to tui na massage during her studies, to help her deal with a normal amount of stress. Because they meet regularly, Dr. East knows when Dolores finishes her certification and lands a job. What’s the difference between Western and Eastern Medicine? For Dr. West, Dolores anxiety is a purely physical or bodily condition. 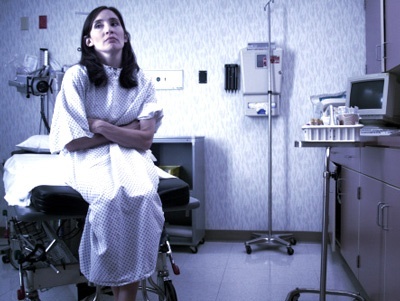 However, for Dr. East, Dolores anxiety is both physical and non-physical. In essence, the difference between Dr. East and Dr. West is that Dr. East takes a holistic approach to medicine, while Dr. West takes a reductionist approach. Reductionist Medicine: The driving principle behind western science is Occam’s Razor, which is the notion that among competing theories, the one with the simplest explanation should be selected. In modern medicine, this has led to the paradigm of physical reductionism, which reduces medical issues to physical explanations and usually prescribes a purely physical solution. It would fair to say that Western medicine views the human body as a machine; every time you're sick, it's simply because one of the body's gears is clogged. 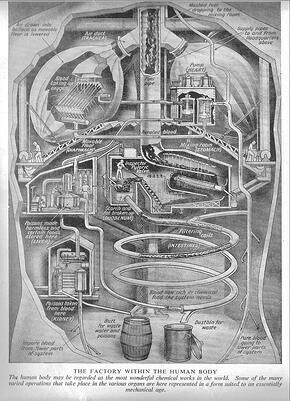 In this image, organs are compared to factory system and are only seen as only serving physical purpose. In the story above, Dr. West gives Dolores a neurological diagnosis (bad brain chemistry) and gives a neurological solution (good chemicals for the brain) to the problem. The reductionist view of medicine is not in itself a bad thing and its focus on physical specialization is preferable to alternative treatments in many circumstances, such as emergency surgery. Holistic Medicine: On the other hand, holistic medicine, also known as alternative or complementary medicine, evaluates the entire person, physical (body) and non-physical (mind), and seeks to heal any imbalances between the two. 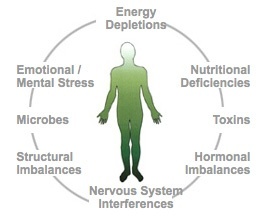 Holistic medicine realizes views the body as a complex system that is affected of both internal and external factors. It emphasizes the body's own ability to heal itself, as well promoting healthy lifestyle changes and preferring naturally occurring remedies, such as meditation and herbal medicines, to synthetically produced compounds. Because it is not reductionist in nature, holistic medicine can also be used as a counterpart to modern medicine. 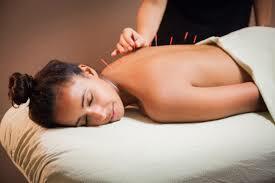 For example, one of the most common forms of complementary medicine is acupuncture. Acupuncture has been found to be successful in pain management, so many people utilize it after conventional surgery to treat pain. Different Philosophy, Different Medicine: The issue that many have with the modern medicine is that its science and philosophy purposely excludes anything that does not fit its paradigm of physical reductionism. It cannot, by its very definition, consider that humans have both physical and non-physical essences. Because of this, many people feel that mainstream western medicine fails to evaluate them as a complete human being. As result, many people are increasingly turning to holistic medicine. Do you think of your body as being more of a machine or garden? 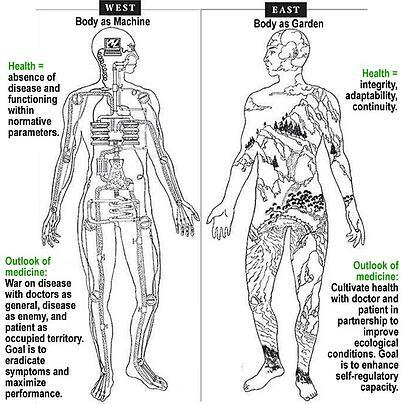 Modern medicine is synonymous with Western medicine, even if it originates in the East. It is referred to as being “Western,” because modern science is rooted in the rationalist philosophy of European Enlightenment. Similarly, holistic medicine is often synonymous with Traditional Chinese or Oriental Medicine. This not to say that all alternative medicine is Oriental or Chinese in origin, but rather that many of core principles and practices are based on the paradigms of Traditinal Chinese Philosophy. Because of this, it is important to understand Traditional Chinese philosophy and views of the body. In the next installment of this series, we will cover the foundations of Traditional Chinese Medicine.